Sir Herbert Merrett (d. 1958), New Cwrt-yr-Ala House, Michaelstone-le-Pit, Glamorganshire, and by descent to the present owner. We are grateful to Dr. Ursula Härting for noting that this is one of three studio derivations from the signed painting, on panel, sold in these Rooms, 23 March 1973, lot 32; for the other two versions, see U. Härting, Studien zur Kabinettbildmalerei des Frans Francken II. - Ein repräsentiver Werkkatalog, New York, 1983, nos. B27, a and b, including that in the Muzeum Narodowe, Warsaw. The present work contains numerous significant differences from the prime version, the main elements in common (apart from the general design) being restricted to the figures of Aaron, the foremost kneeling woman and the man holding an ewer behind her. The number of variations and the able quality of many of its elements suggest that this may either be a collaborative work or by the hand of one of Frans's sons. The story is taken from Exodus, XXXII. The present composition, along with the other versions noted above, employs pictorial narrative to depict the main episodes from the chapter: in the foreground, the Israelites present their gold to be melted down to form the Calf, whilst in the background Moses and Joshua return from Mount Ararat with the tablets of the Ten Commandments to find the Israelites feasting and dancing around the idol. 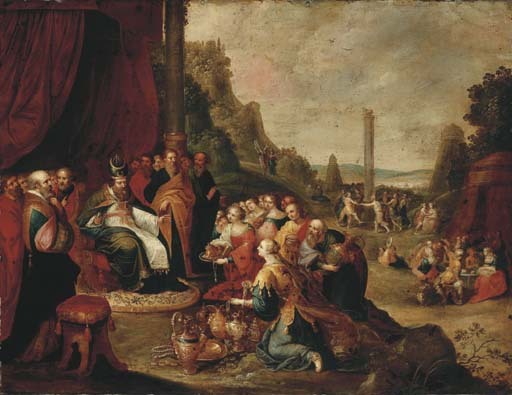 Three other paintings by Francken, including that in the Fitzwilliam Museum, Cambridge, depict the second half of the story with, in the background, Moses having cast the tablets to the ground, breaking them. The present picture was formerly in the collection at Cwrt-yr-Ala in the Vale of Glamorgan. Formerly an estate of the Raleigh family (the name is believed to be a corruption of 'Court of Raleigh'), it had by the beginning of the eighteenth century, passed to the Rous family. Between c. 1800 and 1807 Robert Rous built there 'an elegant villa, in a most delicious retirement ... Any thing more beautiful, on a small scale, cannot well be conceived' (B. Heath Malkin, The Scenery, Antiquities and Biography of South Wales, 1807, I, p. 206); the present picture was probably a part of the original contents acquired by Robert. Having passed by marriage in the 19th Century to the Gore family, Cwrt-yr-Ala was acquired intact with its contents by Sir Herbert Merrett, who in 1939 replaced the house with the present building.